Uncombative by nature, these mid-sized capsule Heartless will disappear after a short time. They hold rare and valuable prizes, however, and should be defeated when possible. They gain speed as they take damage. Don't let them get away! The Bulky Vendor is an Emblem Heartless that is found in Kingdom Hearts II and Kingdom Hearts 358/2 Days. Its main function is to provide the player with prizes. 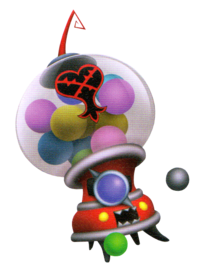 Unlike other Heartless, it has no attacks, and will disappear soon after it is found. Bulky Vendors only appear in one world at a time, but moves to the next one once it is defeated or runs away. If a Bulky Vendor is in the room, a message saying that there is a rare Heartless in the area will appear. However, the Bulky Vendor will not appear until after some of the scenery in the room has been destroyed or used, or if Sora enters a Drive Form. A Bulky Vendor resembles a red and silver gashapon machine. Its rectangular, tooth-filled mouth and glowing, yellow eyes are set in the machine's base, and it uses the four black legs of the machine to move. There is a large, lavender knob just above the base of the machine. A huge, glass sphere with a silver cap is placed at the top of the machine. 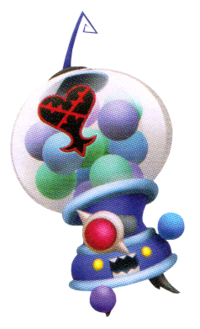 A bent, red antenna sprouts out of the cap, and the Heartless emblem is present on the front of the sphere. The sphere itself is filled with round capsules of a variety of colors, including yellow, blue, light green, and pink. In Kingdom Hearts II Final Mix, the red and silver on the Bulky Vendor become blue and sky blue, respectively, the knob turns red, and its capsules now only seem to include the colors purple, blue, and green. The Bulky Vendor's name references its large supply of items. "Vendor" refers to the fact that it resembles a toy vending machine, specifically a gashapon machine. A Bulky Vendor's HP goes down all by itself, but if Sora uses a Reaction Command on it, it will spit out a rare item. The rareness depends on the amount of HP it has when the Reaction Command is used. The longer Sora waits to use the Reaction Command, the better the prize will be. However, the Bulky Vendor gets faster as its HP decreases, making it harder to catch. If the Bulky Vendor is not used 5 seconds after turning to Prime Capsule, it will disappear. Unlike in Kingdom Hearts II, the Bulky Vendor must be slain in order to get a prize, but it still appears in hidden areas, and disappears soon after it is found. Unlike other Heartless, it will always drop a prize when defeated.